Deborah Hondius joined LALIVE as an associate in 2018. Her main areas of practice are domestic and international litigation, in particular white collar crime and mutual assistance in criminal matters. 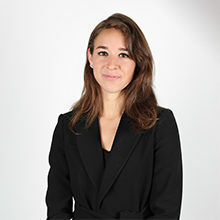 Before joining LALIVE, Deborah Hondius worked in the dispute resolution group of a leading Swiss firm in Geneva, first as a trainee (2013-2014) and then as an associate (2015-2018). She also trained with the Geneva Criminal Court of First Instance before being admitted to the Geneva bar in 2015. Deborah Hondius is a member of the Geneva Bar Association, the Swiss Bar Association (SAV/FSA), the Anti-Corruption Committee of the International Bar Association and the Swiss Chapter of the Women’s White Collar Defense Association. Deborah Hondius holds a Bachelor of Law (with a major in European Law) from the University of Fribourg (2007-2010), a bilingual Master of Law (with majors in Civil Law and Criminal Law) from the Universities of Basel and Geneva (2010-2012) and a Certificate of Advanced Studies in Legal Professions from the University of Geneva (2012).